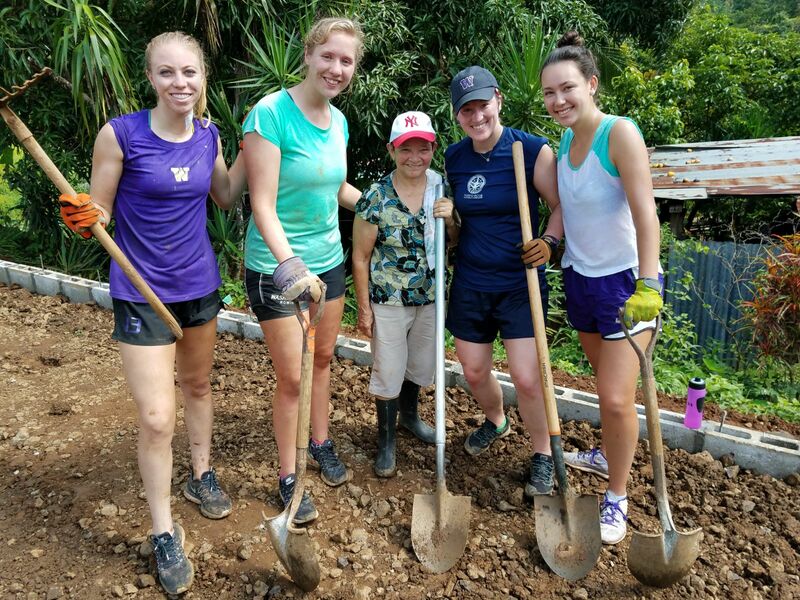 On Monday, May 12th, community members from Matambu, Costa Rica, watched eagerly as student athletes from The University of Washington filed out of two small buses and began unloading their belongings. What initially caught the eye of the community was all of their fancy clothes and nice shoes- and not for the reason you would imagine. The community wasn’t in awe of their Husky athletic gear. They were concerned. How was this group with the bright purple clothes ever going to finish the court? And how were those tennis shoes going to hold up under the duress of concrete work? Matambu is an indigenous community in the heart of the Nicoya Peninsula. One of only five blue zones in the world, meaning people in this area live longer than anywhere on earth. This is due to their healthy, natural diet and physical labor, mostly agricultural. We had an 81 year old man come out to wheelbarrow and the student athletes had a hard time keeping up with him! With changes in diet and technology, it will be interesting to see if the future generations can remain as vibrant. 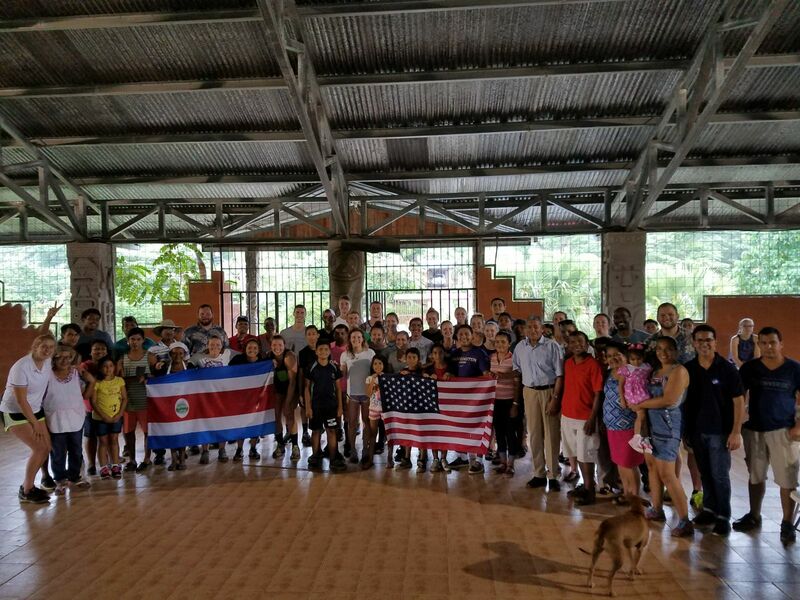 The youth in the community were the inspiration for the court and worked together with Josh Alvarez, a Peace Corps Volunteer from Texas who lives in Matambu, and the community leaders to complete the application to Courts for Kids. There is a beautiful soccer field in the community. However, once rainy season hits (normally in August, but this year three days before our team arrived), the soccer field is a giant, unplayable puddle. The nearest all-year surface for playing sports is in Hojancha, which is 20 minutes by car or a few hours walking. They were really excited for this dream to become a reality and very interested as they looked on to see if this purple clad team was up to the task. They would find out soon enough. The community had been slowed down by torrential downpours and the contractor abandoning the project three days prior to the group arriving. So much prep work still needed to be done before the pouring of concrete could begin. A cinderblock perimeter was half-finished and massive amounts of compacted ground needed to be removed from the interior of the court, due to the previous contractor setting the cinderblock perimeter too low. The group dug in, literally and figuratively. 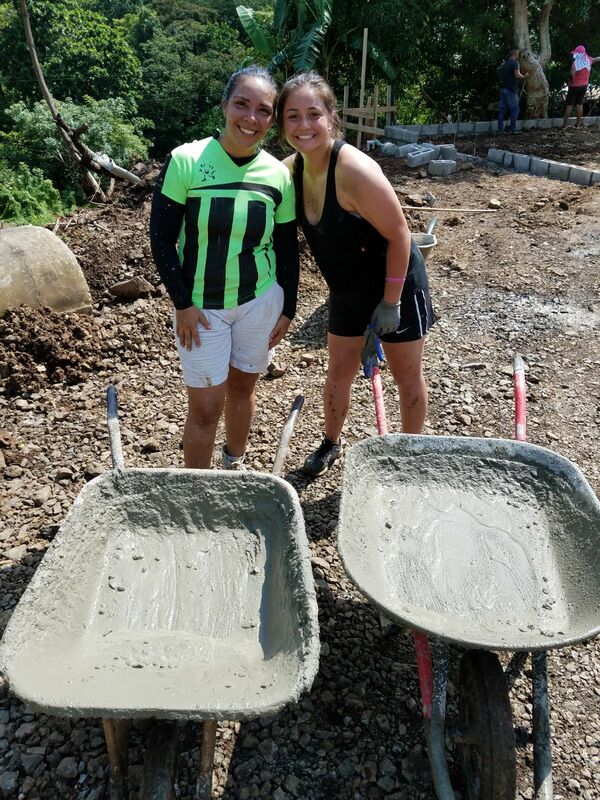 By the middle of the second day, enough earth had been removed from half of the court to begin and so half of the volunteers began pouring concrete while the other half continued to level, trying to stay ahead of the concrete. 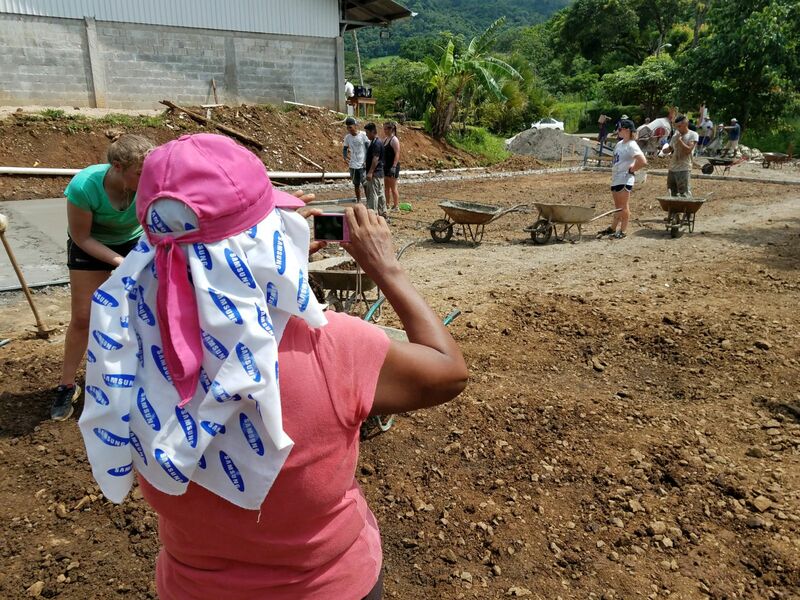 As the work progressed for four days and the court was ultimately finished on time, the community realized that their fears were unfounded and this group came to work and to work hard, despite their fancy clothes. The young men consisted of three football players, one rower, two throwers (shotput, discuss, hammer throw), and two soccer players, which meant that there was not a shortage of guys to throw around cement bags and buckets. 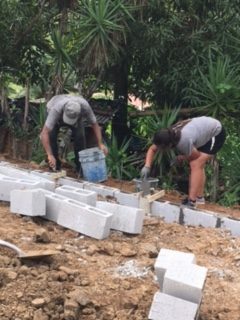 However, it was the young women who were even more impressive to the community, showing that they could carry cement bags and take part in the manual labor right alongside the guys. They consisted of one soccer player, two gymnasts, one thrower, one pole vaulter, two tennis players, three rowers, and two softball players. 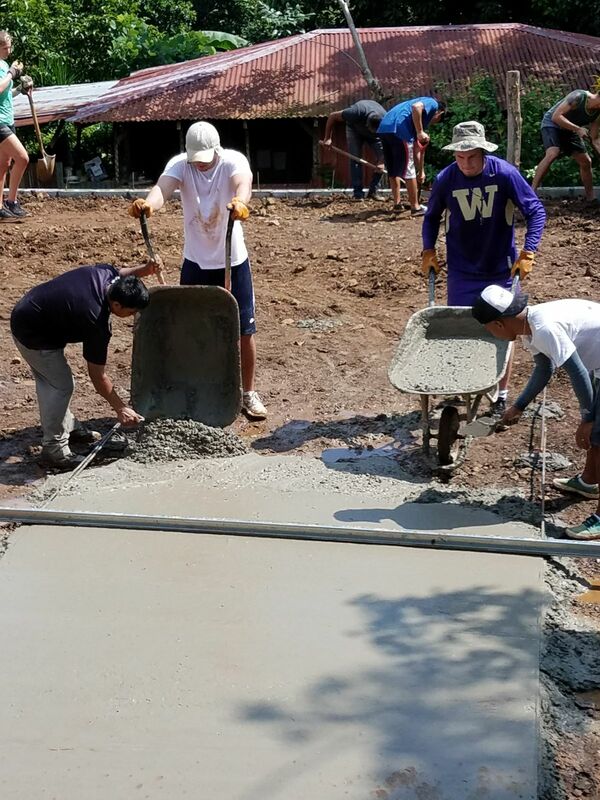 The entire group gave everything to the court, taking advantage of every break in the rain to get as much concrete poured in as short amount of time as possible. The respect was mutual, however, and the Huskies also marveled at community members of all ages who came out to work daily. This was truly a partnership effort. 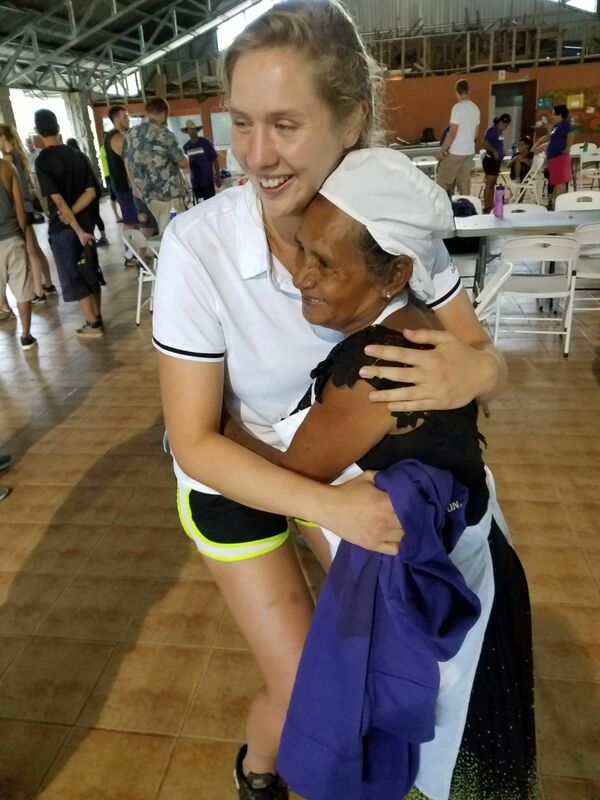 The community had done a series of bingo nights, soccer tournaments, and finding donated materials and labor to make their portion of the court funding possible. And they worked right alongside the UW group now as the concrete pouring was completed. The magic of Courts for Kids trips often happens outside of the court itself as relationships forge between two very different cultures. 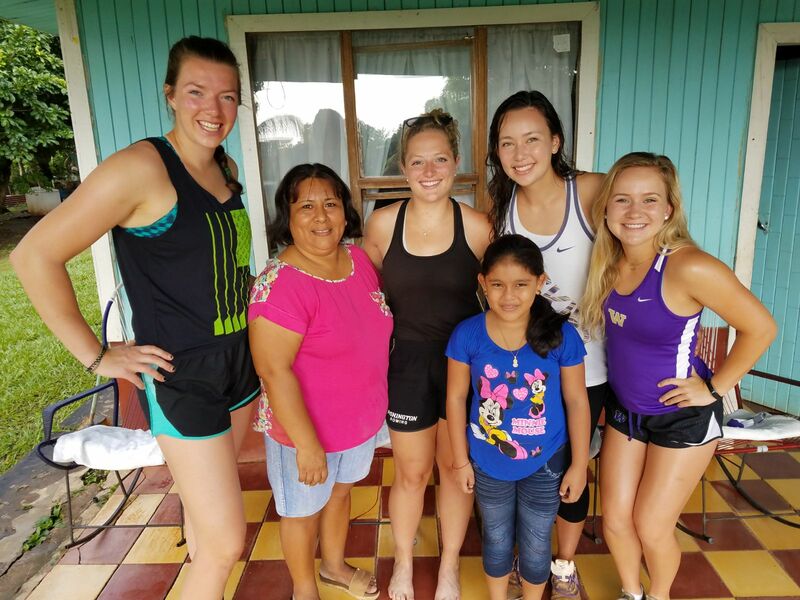 This was made much easier by the generous host families who made room in their humble homes for our team members. The bonds were instant and strong, despite language challenges. 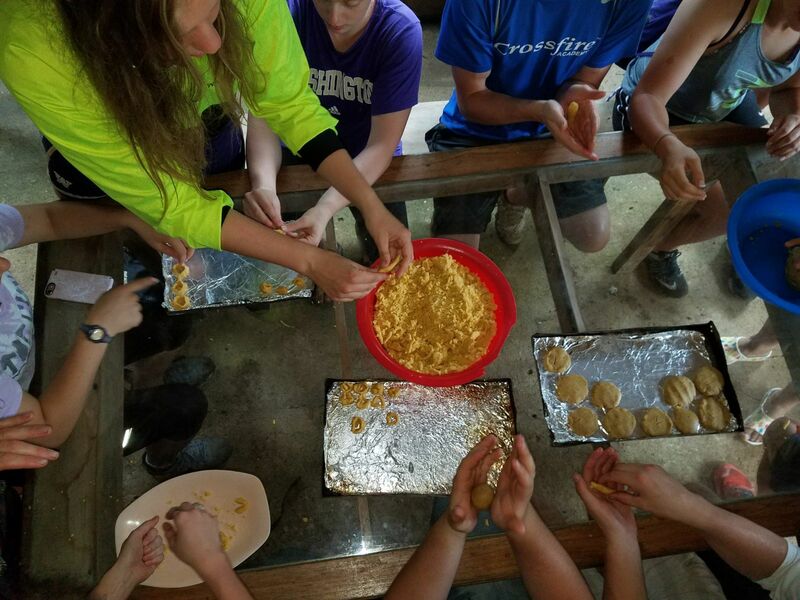 Additionally, there was a talent show, a hike to a waterfall, dancing, a court inauguration, and many impromptu games which brought the two groups together. 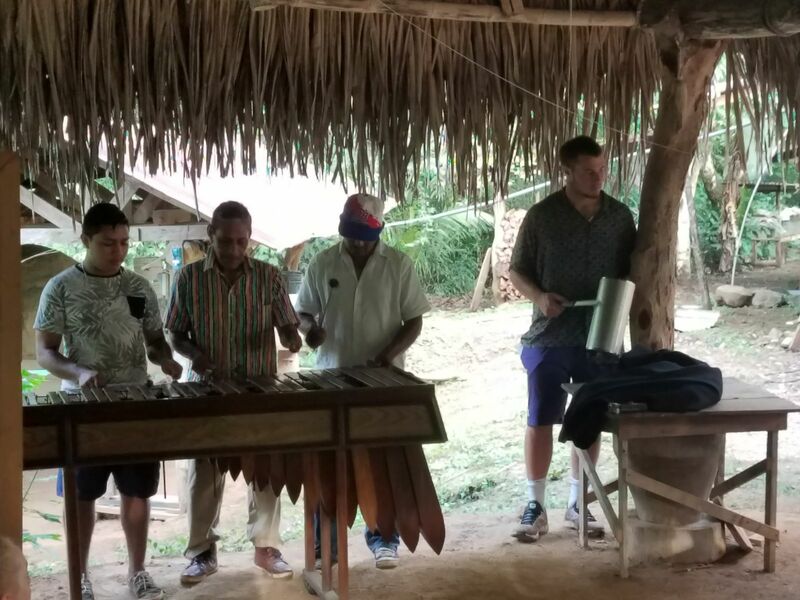 One of the most memorable opportunities for the group was learning about the history of the community and some of the indigenous traditions from some of the elders in the community, men and women who care deeply about preserving their culture. 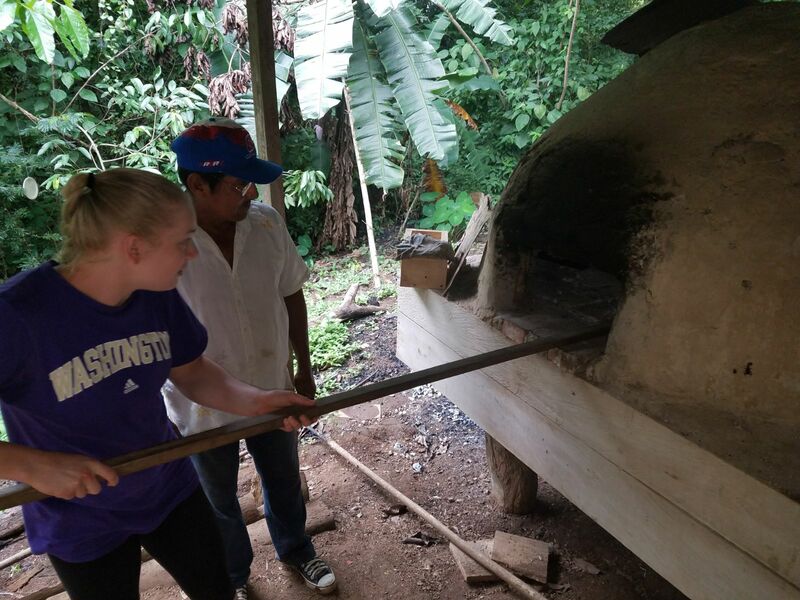 The group learned to make pottery, cooked traditional corn-based pastries and desserts, watched masterful marimba playing, and listened to stories (some very intense) about the community over a bonfire at night. “The community was so welcoming and it really helped me be able to step out of my comfort zone and really take in the full experience. I enjoyed conversing and playing with all members of the community, I have made a lot of friends here just by the simple actions of reaching out and putting myself in their shoes for the week I was here. 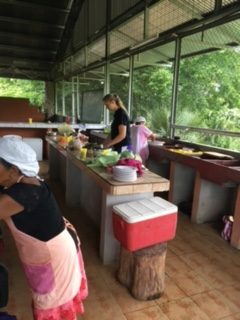 I will forever remember the cultural experiences that I saw and learned here, the food, the language, the pace of life, the daily rituals, the unity and friendship shared between families and the love. 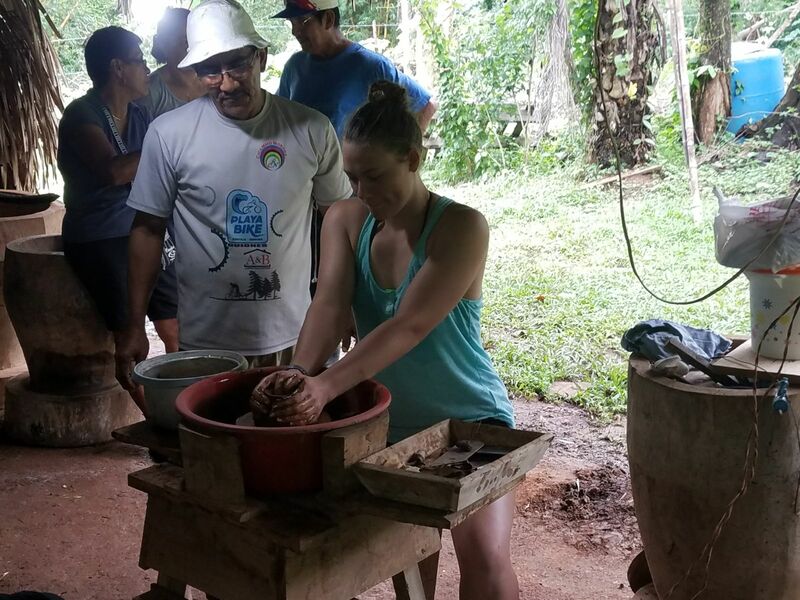 I loved learning about the pottery and the baking class and listening to the locals tell/share stories and ways of life. The waterfall was such a beautiful experience and getting to live with my host family and be welcomed and cared for by them right from the get go is something extremely special and makes me feel so good inside thinking about it, because these people are so caring and loving without having a portion of the lifestyle I’m used to.